Because Psilocybe cyanescens is a fungus, it is safe to assume that we would find it in locations that are moist, warm, and contain organic material that can be decomposed. Although this would encompass the majority of the world, there is a definitive process for this heterotrophic organism to consume organic material. Therefore, where must we look to find where this mushroom grows naturally? Psilocybe cyanescens is found for the most part in the temperate regions of North America and across the span of Europe. The mushroom is most prevalent in the western part of California, because the climate is best suited for their germination. However, in recent years the population of P Cyanescens has spread across the United States, in particular to regions that have undergone expansive development. As machines bring in materials, often mulch, woodchips, and other organic substrates there is a trace of mycelium that develops fruiting bodies, in turn producing a harvest of potent psychedelic mushrooms in public places. Although its wavy cap can distinguish P. cyanescens, it is often confused as a different species of psychedelic mushroom in the genus Psilocybe, most likely because of the similar size, structure, and cap color that the hallucinogenic mushrooms are known for. It is important to remember to always remember to never eat one of these mushrooms in the wild, because of the inadvertent psychoactive component that most likely would not be expected. If you are interested in hallucinogenic properties check out these interesting organisms that contains psychoactive compounds The webpage by Kayleen Toellner on Lophophora williamsii (Peyote) is very educational as is the webpage by Kaitlyn Miedema on Claviceps purpurea (Ergot for LSD). Be sure to view both of these fascinating species in the links included above. The P. cyanescens mushroom does not grow tall in its natural habitat, therefore it has become a fierce competitor for resources. Once fruiting occurs, the growth of the mushroom is unprecedented, and attracts two main predators in its natural environment. Most animals will avoid the mushrooms, however humans cannot resist picking mushrooms, especially ones containing illegal psychedelic compounds. The other organism that will seek out psychedelic mushrooms is reindeer, believe it or not. Reindeer will pick colonies of mushrooms containing hallucinogenic properties and burry the mushroom fruiting body for later use. If you are ever in California or Europe in the late fall and want to go on a scavenger hunt through some unexplored terrain, there isn't a more fun activity than hunting for mushrooms. Make sure to check out the life cycle page on my website in order to see the amazing adaptations that this fungus has undergone, as well as the interactions it has with its external environment. You can also go back and look at the classification of the fungus if you desire. 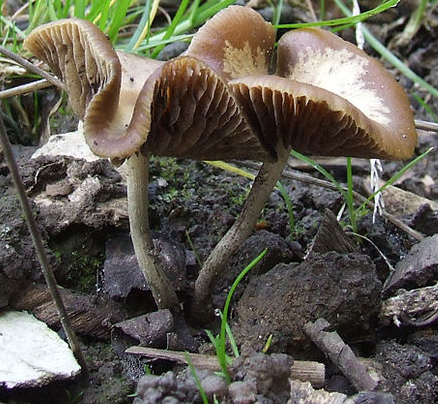 All of this information will help you to make sure you know exactly when and where to properly look to locate the fruiting bodies of P. cyanescens.